But my face… my ugly crying face. I learnt how to make a smiley face on my own, look at this bright beautiful golden tint. That’s what I call talent! I can’t stop my face from showing what I’m thinking. Pisces cannot hide how they feel. Though they may try, the truth is written all over their face. Make your expression a welcoming gift: avoid dour ‘screen face’ from staring down at your phone. This is a found poem. I tried to do something with the Tintern Abbey leaflets I picked up, but there wasn’t enough stuff in there I could use to cobble together one hundred words. So I went on Twitter instead and searched for face, copied a lot of tweets and then rearranged the words and chopped most of them off. It’s a weird one, but I like it. Oh, just so you know, I am in full holiday mode now, so it may take some for me to reply to comments. I’ll get round to it, promise! Good job. This one was really tough. I agree, it was. Thanks! Thanks! I found it quite tricky, but I’m pleased with the result. I love how you pieced it all together! Good read! This is such a cohesive and wonderful “found” poem! Nicely knitted together phrases and sentences! 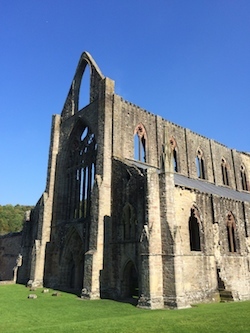 How wonderful that you can go to Tintern Abbey, where Wordsworth wrote in “sympathetic imagination.” Even if you didn’t find anything there, you get to go. What you did write is compelling. It’s a challenge to authenticity in tension with our fashioned faces or living via the computer screen. For found words, there is a thought- and heart-provoking message here. Thank you!